Hello and welcome, it's Deb here today and I am thrilled to be the host for this month's 'Winter Magic' challenge here at A Vintage Journey! For us in the northern hemisphere December brings the start of winter and for many that means freezing cold weather and Christmas. But winter is so much more than that and so we ask, how would you interpret the magic of winter? Snow, icicles, colours of blue, silver and white, the festivities of Christmas, misty winter landscapes; show us what your magical focus is for the season! As always, we ask that you follow our Traveling Instructions and that your project be created in a vintage, shabby, mixed media, art journaling, industrial or steampunk style. 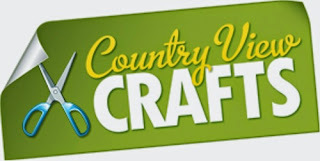 and they are offering a £20 voucher to their online store, www.countryviewcrafts.co.uk, for our randomly chosen winner. Thank you Country View Crafts! The Creative Guides will also choose three Pinworthy winners who will receive a Pinworthy badge to display on their blogs, as well as an invitation to be a guest designer here at A Vintage Journey for one of our future challenges. To get you started, the Creative Guides have created some wonderful projects to inspire you, enjoy! 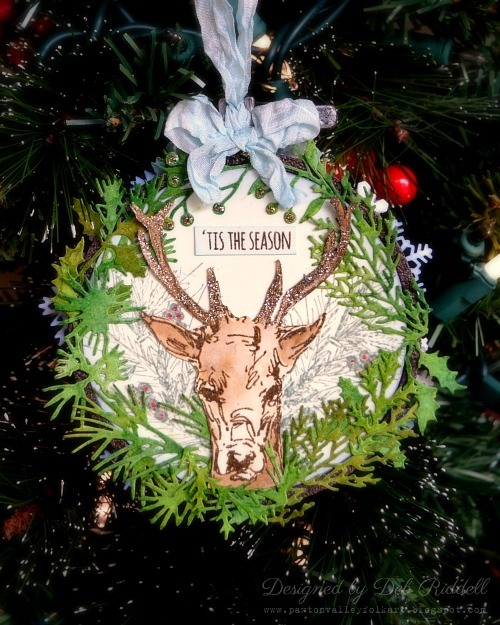 I decided to make a Christmas ornament for my Winter Magic project since one of the most magical things about the winter season for me is Christmas! I used Eileen Hull's Embroidery Hoop die as a base and thus was able to adorn both sides with some of my favourite winter images and themes. 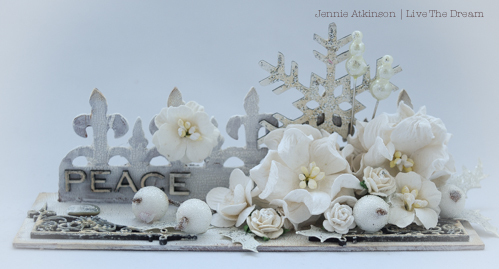 Hope you can stop by my blog to view the other side of my ornament and for some step by step photos of how I created it. I have missed the last couple of challenges and it is good to be back! 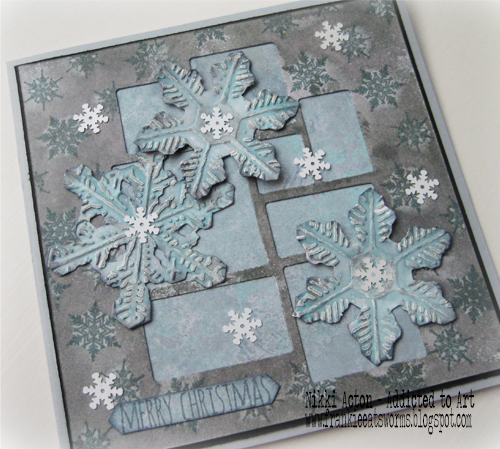 For Deb's theme I have used two Tim Holtz Bigz dies - Snowflake Duo and Mosaic - to create my blue and silver Christmas card. More details over at Addicted to Art - be lovely to see you there! 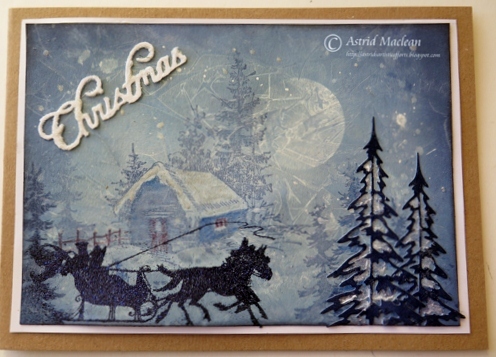 Having spent two Christmases in Australia, I had great fun creating this dreamy Winter Magic card. If you want to see some more detail and a short step by step, just click here. For me the magical focus for the season is spending quality time with family and of course taking time to create those all important cards and decorations for family and friends. 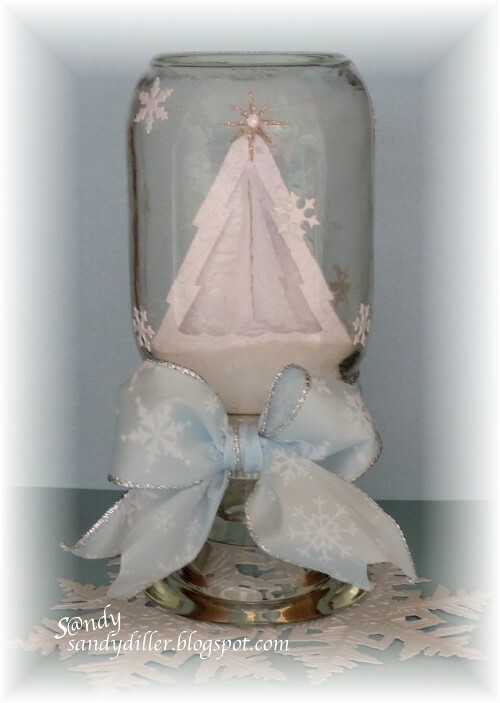 Pop by my BLOG for more details on how I created my card and glass decorations. When I think Winter Magic - I think of snow covered trees in the meadow - so that's what I've shared today. To add that vintage feel I've contained it all in a canning jar. I would love for you to stop by my blog here to find out more. The start of the Christmas season for me is Advent Sunday when we write our Christmas lists by candlelight and make a Gingerbread House, so I've made a "not-Gingerbread House". 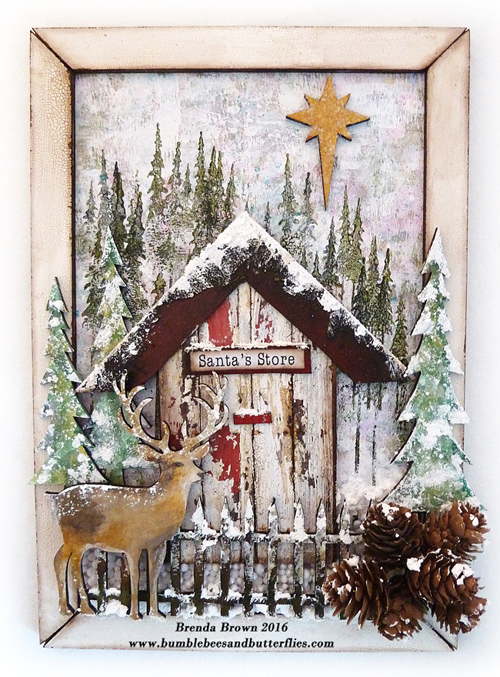 I used the Tim Holtz die and I gave it a wintry forest setting for that cosy feel, which is also such a magical part of winter for me... being wrapped up warm inside (with a tasty Gingerbread Latte!) whilst the winter weather takes hold in the outside world. Come over to Words and Pictures for the full cosy effect and to see those rusty snowflakes in close-up. For me the beauty of this season extends beyond the sparkling lights, trees and tinsel. The last traces of fallen leaves caught beneath a snow/frost laden carpet, and revelation of weather-beaten structures, unburdened by much of the usual floral and fauna, are as magical as any festive decorations. Find out how this came together and see the close ups on my blog. For my Winter Magic project I decided to make a small decoration to join some of the others which sit on our mantelpiece over the Christmas period. I cut a base and a die cut fence from greyboard and went mad with the crackle! Do join me over on my blog if you would like to see some more details. 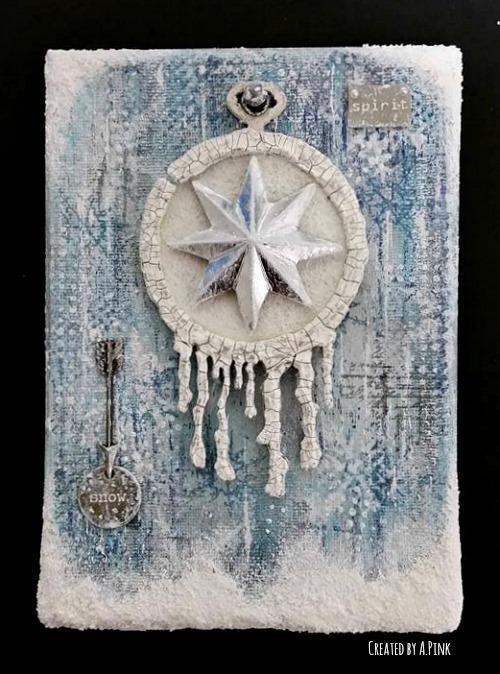 Snow always comes to mind when I think of 'Winter Magic' so for Debs Challenge I have a canvas to share with a snowy feel created with an arty, wintry spirit . Please feel free to stop by my blog for more details. I love bright, cold, frosty days and snow covered landscapes in the middle of winter and that's what came to mind when I was thinking of a project to do for Deb's challenge. I decided to use one of my picture frames from Tando Creative and also found one of the beach huts that didn't get used in the summer so I decided to utilise it for a winter scene. There are more photos and details at Bumblebees and Butterflies if you fancy a hop over. 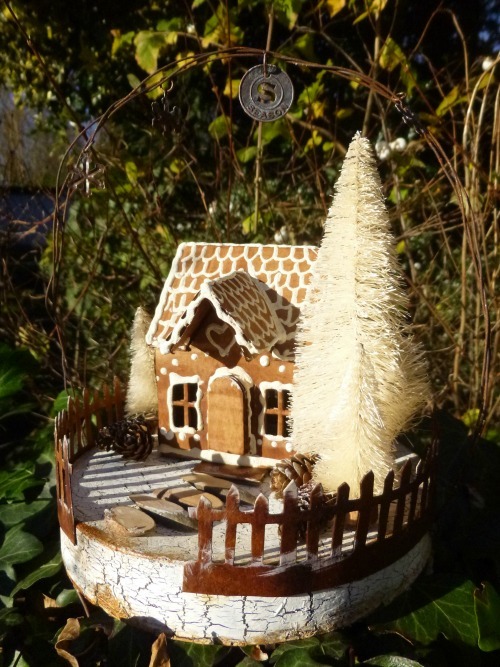 Wonderful and magical creations from the Creative Guides, don't you agree?! And now that you have been inspired, we hope that you will create your own 'Winter Magic' projects and join in our December challenge. You have until Thursday, January 5th to enter and we can't wait to see what you link up, happy creating! Fabulous Winter Magic from the team. Each project is so original and imaginative. Off to visit the blogs now. Such fabulous wintry projects... looking forward to hopping round for a closer look later today, all being well! Fabulous inspirational work. Love the designs. 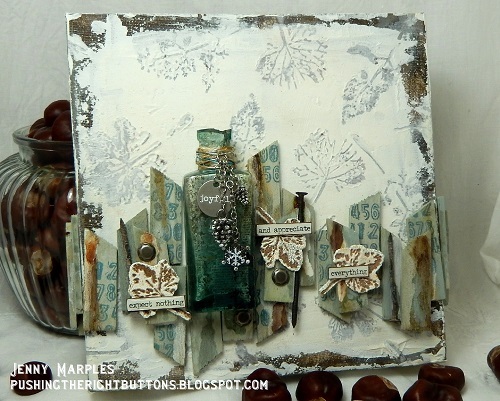 I love your beautiful challenge theme, just right for the christmas fairytale time! All your inspirations projects are so wonderful!!! You projects are all totally delightful ladies, what a feast for the eyes, WOW!!! Super festive inspiration from the whole team. 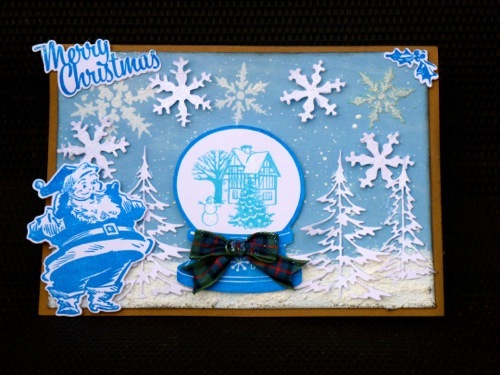 Gorgeous Winter Magic from the Design Team!